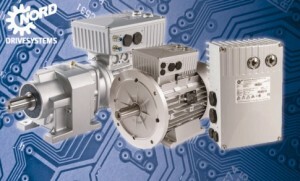 AC Motors that are connected directly to their power source exhibit heightened power consumption during starting and stopping and can demand up to seven times of the rated motor current irrespective of load. This can create irregular starting and shut down behaviors as well as unnecessary strain on all components involved. NORD has created a simple and economical solution to these unnecessary risks associated with running electric motors as your primary mover. The SK135E/SK175E regulates the three major functions of a motor starter and controls them in order to protect your equipment and what you are moving while saving you money in the process. The product series consists of a basic model; the SK135E and an enhanced model; the SK175E that have either ASi or Profibus DP onboard networking.